Place veal between 2 sheets plastic wrap. Pound with a meat mallet until 5mm thick. Cut veal in half crossways. Lightly coat veal in flour, shaking off excess. Dip in egg, then coat in breadcrumbs. Refrigerate for 30 minutes. Meanwhile, heat 2 tablespoons oil in a large saucepan over medium-high heat. Add onion, garlic and celery. Cook, stirring, for 6 to 8 minutes or until tender. Add stock cubes, 2 cups cold water, tomatoes, sugar and basil. Stir to combine. Bring to the boil. Reduce heat to medium-low. Simmer, uncovered, for 20 minutes or until sauce thickens. Preheat oven to 180°C. Grease a 7cm deep, 24cm x 25cm (base) baking dish. Heat butter and remaining 2 tablespoons oil in a large, non-stick frying pan over medium-high heat until hot. Cook veal, in batches, for 2 to 3 minutes each side or until golden. Drain on paper towel. 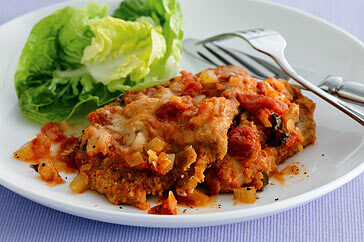 Arrange veal in 2 layers, overlapping, in prepared dish. Top with mozzarella. Spoon over tomato mixture. Sprinkle with parmesan. Spray lightly with oil and bake for 20 to 30 minutes or until golden brown. Serve with dressed lettuce leaves.